Egyptian archaeologists have unveiled an incredibly detailed and decorative tomb in the Giza Governorate. The 4,400-year-old site belonged to a Fifth Dynasty nobleman called ‘Khuwy’. The L-shaped tomb’s chambers bear inscriptions and colorful reliefs that are so well preserved that the experts excavating the site were able to discern the fingerprints of the tomb’s painter. 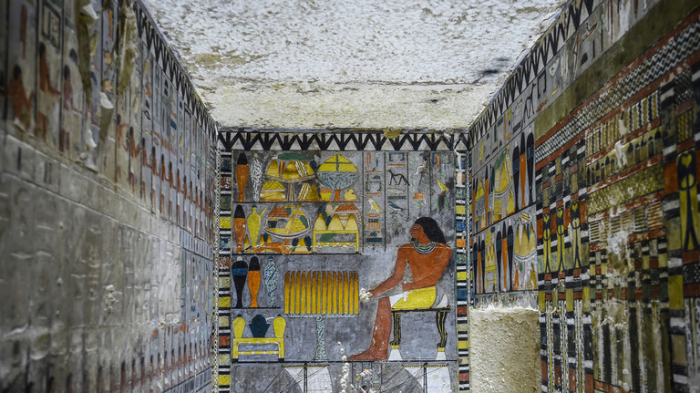 The tomb itself is mostly made from white limestone blocks, while the stunning paintings within were created with a special green resin, according to the Egyptian antiquities ministry.